Palm-fringed beaches? Check. Limpid lagoons? Check. Tropical rainforests? Check. The twin-island nation of St Kitts and Nevis embodies everything travellers have come to expect from the Caribbean, except, that is, for the crowds. Somehow, this vibrant island state has remained under the radar of mass tourism, carving out a niche as an alternative destination for those looking to avoid more mainstream Caribbean islands. The smallest sovereign state in the Americas, St Kitts and Nevis are compact and easy to navigate, which is just as well because the pace of life here is slow – and proudly so. 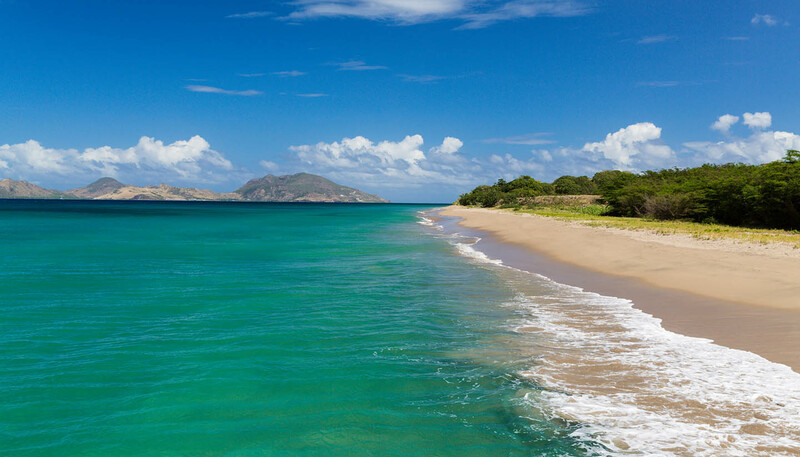 St. Kitts is the larger and more developed of the two and is home to the laidback capital, Basseterre, a former colonial outpost renowned for its historical monuments, vibrant markets and lively beach life. Dominated by Mount Liamuiga, a dormant volcano carpeted with verdant rainforest, Kitts is also home to the defunct British fortress, Brimstone Hill, one of the best preserved citadels in the Americas and a UNESCO World Heritage Site. Remnants of the sugar cane industry, once the beating heart of the Kitts economy, remain; old sugar plantations have found new lives as bijous hotels and restaurants, while the island's narrow-gauge railway, once used to transport the cane, has become a popular attraction. And then there's Nevis. Fanned by trade winds and dominated by an active volcano, this island is the quieter of the two. The scenery remains relatively unchanged by progress; its undulating landscape punctuated by plantation-style hotels which offer lazy lunches and charming lodgings. Those looking for something more adventurous can pass the days hiking through forests, pedalling down mountain trails or surveying the island's coral reefs, which are popular with scuba divers and snorkelers. There is little competition for space on Nevis' powdery beaches, and, for the discerning gastronome, there are plenty of excellent restaurants to choose from. St Kitts and Nevis will, alas, not stay under the radar forever. The authorities are keen to boost tourism and those familiar with this corner of the Caribbean will be hoping they do it without diluting the islands' many charms. 261 sq km (101 sq miles). Saint Kitts: 168 sq km (65 sq miles). Nevis: 93 sq km (36 sq miles). Queen Elizabeth II since 1952, represented locally by Governor-General Samuel Weymouth Tapley Seaton since 2015. Prime Minister Timothy Harris since 2015. Consular support may be limited in St Kitts and Nevis as there is no British High Commission office. However, the British High Commission in Bridgetown, Barbados, can provide consular support. Most visits to St Kitts and Nevis are trouble-free but there have been incidents of crime including murder, armed robbery and sexual assault. UK health authorities have classified St Kitts and Nevis as having a risk of Zika virus transmission. For information and advice about the risks associated with Zika virus, visit the National Travel Health Network and Centre website. Although there’s no recent history of terrorism in St Kitts and Nevis, attacks can’t be ruled out. Driving is on the left. To drive on the island you must get a local temporary driving licence. The car hire companies will usually assist with this process. You must present a valid UK driving licence. British passport holders don’t need a visa to visit St Kitts and Nevis. On entry, you will be granted a specified period to stay. If you wish to stay longer you must apply and pay for an extension of stay through the St Kitts and Nevis Immigration Department. It is an offence to overstay the entry period or to work without a work permit. Your passport should be valid for a minimum period of six months from the date of entry into St Kitts and Nevis. UK Emergency Travel Documents are accepted for entry, airside transit and exit from St Kitts and Nevis. Entry requirements may change from time to time. You should check with the St Kitts and Nevis High Commission in London before you travel. The departure tax is now included in the cost of your airline ticket. Cases of Chikungunya virus have been confirmed in St Kitts and Nevis. You should take steps to avoid being bitten by mosquitoes. Medical treatment in St Kitts and Nevis can be expensive. Make sure that you have adequate travel health insurance and accessible funds to cover the cost of any medical treatment and repatriation. If you need emergency medical assistance during your trip, dial 911 and ask for an ambulance. You should contact your insurance/medical assistance company promptly if you are referred to a medical facility for treatment. Before choosing to be treated at a private facility, you should check their policies on pre-payment. Private clinics may not accept medical travel insurance as payment for treatment. The hurricane season in the Caribbean normally runs from June to November. You should monitor local and international weather updates from the World Meteorological Organisation and the US National Hurricane Centre. Earthquakes are a potential threat and tremors are felt occasionally in the Caribbean. In the event of an earthquake, you should be directed by the local authorities. To learn more about what to do before, during and after an earthquake, visit the website of the US Federal Emergency Management Agency.